Astrophotographer Chad Blakley sent in a photo of an aurora display seen over a small fishing village on the Lofoten archipelago of Norway. Image taken Oct. 8, 2013. A dazzling northern lights show lit up the Norwegian night sky this week and a veteran space photographer captured the celestial display in a stunning new video. 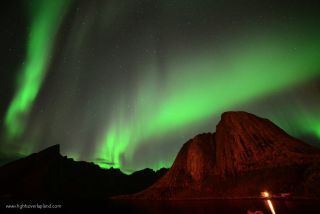 Astrophotographer Chad Blakley and his wife Linnea traveled to the northern fishing village of Reine in Lofoten, Norway on Tuesday (Oct. 8) to see the northern lights. There, they captured a video of a brilliant example of the aurora borealis above stark outlines of mountains in the distance. "We saw auroras from the moment the sun set and the show lasted well into the night," Blakley wrote in an email to SPACE.com. "We were lucky enough to see spirals, curtains and arcs — some of my favorite types of aurora displays!" The northern lights, or aurora borealis, are created when charged particles flung by the sun into space crash into Earth's atmosphere near the poles. Auroras over the South Pole are known as the southern lights, or aurora australis. The particles are driven toward the poles by the planet's magnetic field. Solar storms shoot out groups of these particles, which can cause geomagnetic storms on Earth, possibly producing stunning light displays. In August, Blakley released another incredible video showing the aurora borealis above Abisko National Park in Sweden. The video was made using thousands of hours of Northern Lights footage taken between 2012 and 2013 to mimic what the northern lights look like in real time. "The film uses a new time-lapse technique that allows me to show you the auroras in a way that I never thought possible — virtual real time," Blakley told SPACE.com in August. Although the sun has been somewhat quiet in recent months, the star unleashed its strongest solar flare in two months on Oct. 8. The moderate M-class flare caused a minor geomagnetic storm as speeding particles passed Earth. The flare wasn't aimed directly at the planet and the storm has subsided, but forecasters with the Space Weather Prediction Center, a division of the National oceanic and Atmospheric Administration think that another wave of geomagnetic activity might not be far behind. You can watch the full HD version of the new video at Blakley's Vimeo site.